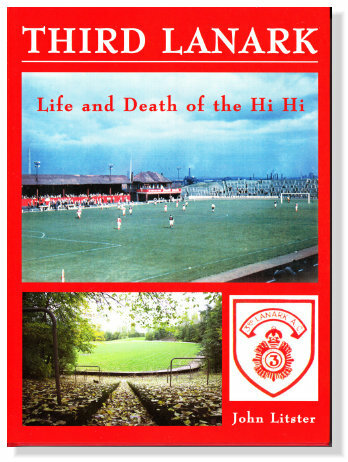 The story of how a club died, tracing the roots of the problems which culminated in the extinction of Third Lanark in 1967, told in one half of this major book. The other half tells of the club’s history ; formed in 1872, twice winners of the Scottish Cup, Scottish League Champions in 1904, and a power in the Scottish game over its first half century. Also told is the story of the two Cathkin Parks, hosts to Scottish Cup Finals and International matches before the First World War. Statistics include results, scorers (for both teams) and attendances for all League, Cup and local cup ties, and season-by-season summary statistics for appearances in League and Scottish cups. John Litster, PM Publications, 38 Lowther Road, Norwich, NR4 6QW. Third Lanark was one of the top clubs in Scottish football for the first 50 years of its existence. Formed in 1872, Thirds were founder members of the Scottish Football Association and the Scottish Football League, whose championship they won in 1904. They were twice winners of the Scottish Cup, and their last two grounds, both called Cathkin Park, hosted Scottish Cup Finals and Scotland international matches. In its last decade, the club played in a Scottish League Cup Final and finished third in the First Division, scoring 100 League goals in the process. This distinguished history, and the impressive list of Scottish international footballers to have played for the club, make it all the more bewildering that they were allowed to die in 1967, in their 95th year. Their death has been popularly attributed to the actions of their majority shareholder for the last five years of the club’s existence, but the reason for the club’s demise is not quite as simple and as straightforward as the mismanagement by one man. The seeds of the club’s destruction were sewn as far back as the very early years of the 20th century, and the confluence of events which eventually led to its extinction include decades of disharmony amongst shareholders and in the boardroom, the cost of purchasing (the second) Cathkin Park, the expense of developing it as a modern ground which could hold over 40,000 spectators for Glasgow derbies, the financial burden of full-time football and the difficulty in replacing top class players who either retired, or were transferred for substantial fees. While these undercurrents were loosening the foundations of the famous old club, the club’s loyal band of supporters were watching the ups and downs of its playing fortunes. Both stories, on field and off, are told concurrently in the pages of this book. Also included are full statistics of matches played in League and Cups, and the players who played in them. Initially a story of endeavour and success, it has the saddest possible ending nearly a century later. The book explains how and why this happened, and gives the reasons why the club which launched the careers of Jimmy Brownlie, Jimmy Mason, Jimmy Denmark, Jimmy Carabine, Ally McLeod, Bobby Mitchell, Ronnie Simpson, and the famous forward line of Goodfellow, Hilley, Harley, Gray and McInnes, is no longer with us.